To innovate profitably, you need more than just creativity. Do you have what it takes? 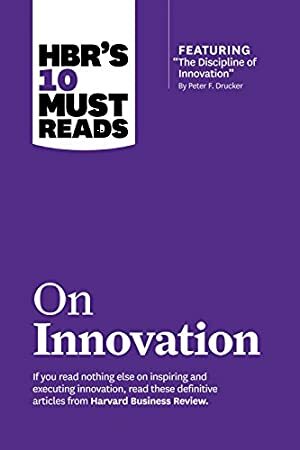 If you read nothing else on inspiring and executing innovation, read these 10 articles. We've combed through hundreds of articles in the Harvard Business Review archive and selected the most important ones to help you innovate effectively. Track It. This book has been $12.41 within the past year. Log In to track Clayton M. Christensen on eReaderIQ. to be notified each time the price drops on any book by Clayton M. Christensen. to stop tracking Clayton M. Christensen. Log In to track Harvard Business Review on eReaderIQ. to be notified each time the price drops on any book by Harvard Business Review. to stop tracking Harvard Business Review. Log In to track Peter F. Drucker on eReaderIQ. to be notified each time the price drops on any book by Peter F. Drucker. to stop tracking Peter F. Drucker. Log In to track Vijay Govindarajan on eReaderIQ. to be notified each time the price drops on any book by Vijay Govindarajan. to stop tracking Vijay Govindarajan. We started tracking this book on February 24, 2013. The price of this book has changed 68 times in the past 2,247 days. The current price of this book is $14.74 last checked 9 hours ago. This lowest price this book has been offered at in the past six months is $14.49. This lowest price this book has been offered at in the past year is $12.41. The lowest price to date was $2.49 last reached on August 11, 2013. The highest price to date was $15.06 last reached on December 13, 2017. This book has been $15.06 one time since we started tracking it. We last verified the price of this book about 9 hours ago. At that time, the price was $14.74. This price is subject to change. The price displayed on the Amazon.com website at the time of purchase is the price you will pay for this book. Please confirm the price before making any purchases.